House Kinsman is an epic Agility creature card. It is part of the Core Set. 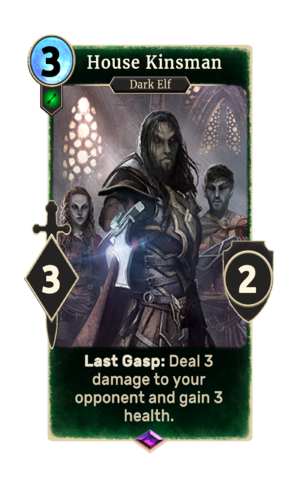 In addition to the card's availability in the Core Set, one copy is included in the Dunmer Avengers deck, and one copy in the Telvanni Ambition theme deck. "By the Lord, Mother and Wizard, I see their strategy!" "They cannot hope to outwit me." "You are no match for me, s'wit"
"This... will be... my... last... battlefield!" This page was last modified on 25 February 2019, at 01:35.